Top analysts predict that IoT could generate up to $11.1 trillion in global economic value by 2025. Yet some challenges occlude the path from realizing these gains. The major one being lack of IoT-specific skills & knowledge among the developers to build and implement customized IoT use cases. Secondly, the benefits of collective industry efforts and co-innovation partnerships are unknown to many business markets. As a result, four out of five IoT projects will overrun their schedules and budget. The key for a successful IoT business is directly tied to the strategic partnerships. Software vendors should allow enterprise customers, SI’s and VAR’s to leverage the power of IoT and transform their business by closely working with partners who are empowered with accessible technology and quality service. This enables businesses to create and capture unique IoT opportunities, reach out to new customers and grab the market leadership. The above critical challenges are now being addressed by the combination of WebNMS & Advantech-BB which eases out IoT application creation & deployment. WebNMS has partnered with Advantech-BB, a leading global provider of intelligent IoT enabled hardware & connectivity solutions, which will combine its pragmatic innovation, engineering and integration capabilities with WebNMS’ industry-leading Symphony IoT platform to build and offer edge-to-cloud IoT solutions across verticals. After three decades of growth and over 3 million M2M connections with success stories around the world, Advantech-BB has acquired a global reputation as a manufacturer of resilient & reliable connectivity hardware. The focus of this endeavor is to allow customers/partners to quickly develop & deploy vertical-based IoT solutions in the areas of energy management, remote monitoring, building management, smart sensing, renewable energy, and much more. Symphony IoT platform and its rapid application development capabilities combined with Advantech-BB devices will undoubtedly open up new frontiers for enterprises to accelerate their IoT journey, scale up the business and quickly take end-to-end customized use cases to commercial-scale deployment. As part of partnership, WebNMS was successful in porting the Symphony EdgeX software agent into their Smartflex (SPECTRE v3 LTE) – Cellular router from Advantech-BB that provides secure Internet connectivity for devices and LANs via the cellular networks. Symphony EdgeX is a revolutionary IoT agent that eases devices & applications to seamlessly discover, acquire and process immense data smoothly and securely. Spectre V3 empowered with Symphony EdgeX enables customers connect their equipment to the cloud seamlessly and effortlessly, transforming the IoT enablement process into plug-and-play. With an extensive protocol support, the agent is equipped with local decision making capability wherein agent by itself counteracts on abnormalities without waiting for response from remote server. The agent is now tightly integrated with Spectre V3 LTE providing connectivity to equipment / devices and is capable of supporting any customized IoT use cases developed over Symphony IoT platform. In addition, WebNMS is also working on integration of Symphony IoT platform with Advantech-BB’s SmartWorx Wzzard Intelligent Wireless Sensor kit to facilitate the Internet of things (IoT) world of connected intelligence, where machines and systems will collaborate, inform and make decisions based upon sensors data. Wzzard kit works on SmartMesh IP wireless sensing technology from Linear Technologies Dust Networks. Wzzard’s nodes attach automatically, and the SmartMesh IP technology dynamically self-configures to re-form the mesh network. 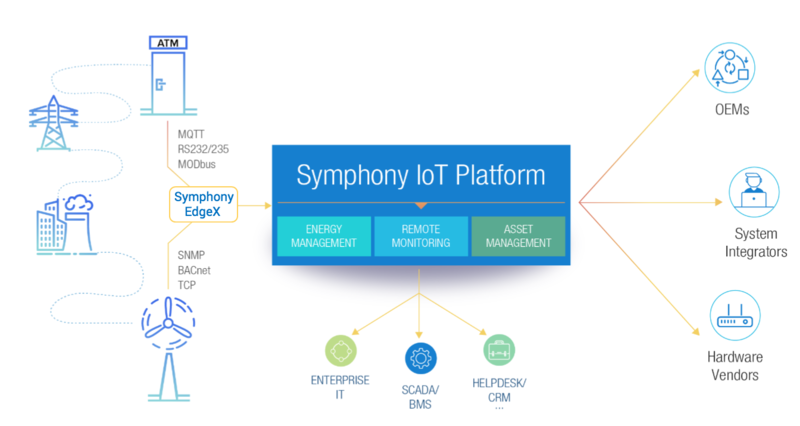 The IoT scope is been widened to help integrators and service providers to efficiently develop and deploy secure, smart, self-powered, and scalable IoT applications with the use of Symphony IoT platform. So what does the customer gain? Customers/Partners can now use Symphony IoT powered Advantech-BB’s gateways to easily build and deploy variety of cross-vertical IoT projects across domains with minimal effort and cost. What takes several weeks is now made easy & expeditious. The partnership will also enable businesses to support more customers, manage their expenses, bridge productivity gaps between teams and grow their business – all with the single, unified Symphony IoT platform. WebNMS has been hard at work crafting the whole Symphony IoT package – an edge-to-cloud IOT solution, that doesn’t stop with just connecting and monitoring the remote/mobile products, but also ensures that enterprises deliver improved business service, reveal untapped potential, create new value and provide better customer engagement. © 2016 Zoho Corporation Pvt. Ltd. All Rights Reserved.